Yes, do bring back milk and honey creams. These were my all time favourite biscuits when I was young. Like so many of your previous correspondents, milk-and-honey biscuits were the top of my favourite biscuit list. They mysteriously disappeared from the shop shelves, maybe when biscuit boxes were replaced by packaged biscuits and no longer sold by the pound, and were never seen again. If there is any justice in the world, they will make them again for me to relive my childhood and for upcoming generations to have a new experience and delicious in life. Please bring Milk and Honey back. I often think of them and never understood why they stopped being produced. I absolutely loved them. N. B. Same recipe please. I liked them so much my mother brought me a full box of packets from the wholesaler in Bradford. I have been looking for these for 40 odd years. I was begining to think I imagined them even excisting. How I loved them. Please bring them back, in this health conscious world they are an ideal way to remain healthy!! My Mum worked in Huntleys in Huyton during the 70s and would buy these from the factory shop. Best biscuits in the world. Sorry to find you can no longer buy them. Chocolate Oliver's was another favourite and I've managed to buy these from the online shop at Huntley and Palmers. Only one way to eat them... take the biscuit off, nibble the cream and go for the honey centre last of all. Brilliant, bring them back! I grew up in New Zealand and these were my all time favourite biscuits so if Huntley and Palmer ever brings them back I will be buying them. I'm always going on about these biscuits and how my late mum bought them as treat for me, we lived in Reading not far from Huntley and Palmers factory, nothing today compares to them.I to would love to see them brought back. Surely M&S could come up with a copy of these delightful biscuits. The creamy filling and the lovely "honey" filling were highly addictive. Talked about them at work yesterday found them today on the net want to buy them now after 50 years I want them back.please please please. These beautifully crafted biscuits were part of my childhood landscape, my Mum who is not no longer with me sadly bought them as a treat, they were delicious! and dunked perfectly as they stayed in one piece after dipped in tea. I miss these biscuits and finding this picture of them was a delight. I agree! BRING THEM BACK HUNTLEY AND PALMERS! no idea why they were discontinued in the first place they were far superior to custard creams, were they perhaps more expensive to manufacture and therefore not cost effective? So glad to find others who remember this excellent biscuit. Remember them in 50's and 60's...only Custard creams and Bourbons come close. These were my favourite biscuits. I can't find anyone who remembers them though, so it's nice to see other comments. These were my favourite biscuits. I really wish they were still made today. I remember my nan keeping a stock of these in her pantry for us whenever we went to visit her in Wales. Would love to see them make a comeback! I to loved these biscuits, I used to have them during the morning break at my infants school with the small bottle of milk that we had every day. The teacher charged us 1 old penny for 2 of them. 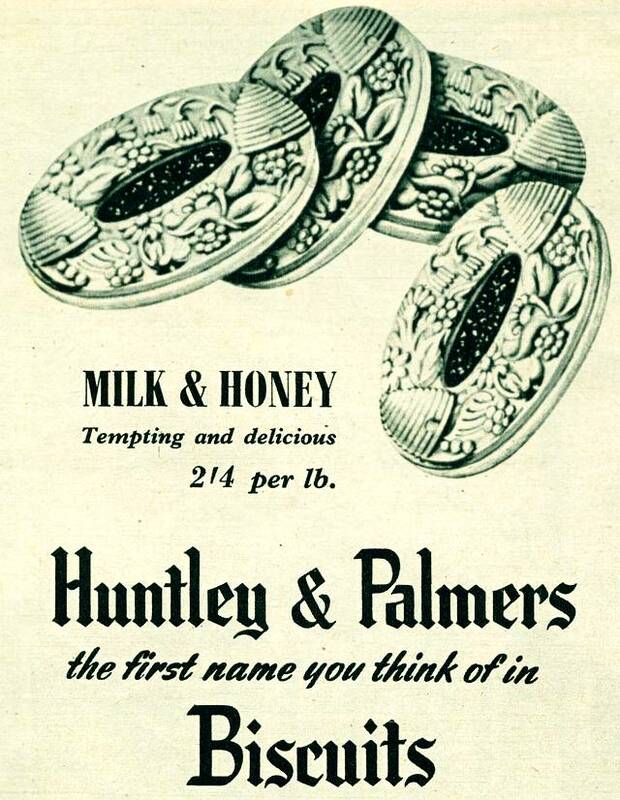 They were the best jam and cream biscuits ever made, nothing has ever come close in taste or texture, BRING THEM BACK HUNTLEY&PALMERS !!!!! I would always pick the the Milk and Honey biscuit from a tin of assorted bisuits. I still miss them! I am known to split open a custard cream, smear a litle honey on the middle, and re-join it! Its the nearest I can get to re-creating the taste, but the honey lacks the 'chewiness' of the originals. Try it! Worlds best biscuit. Even thinking about them makes me all misty eyed. The jam sandwich biscuit was a decent offspring but the jammie dodger an abomination by comparison. The best biscuit ever made by the best maker. If only they were still around today. These were my very favourite biscuit, oh how I wish they could be made again, certain they would be a best seller! Yes, I too remember them very fondly. On my fifth birthday, my mother had the table all laid out including a plate of these simply delicious treats. The plate was empty within seconds. Best biscuit I've ever tasted. I loved them too. I was just looking to see if they are still availabe, but alas they are no more! I bet they would sell if re-introduced. used to love these biscuits as a child in the 60s. Always wondered what happened to them!